While not as cataclysmic as the failure it faced in 2008, the investment bank is being squeezed hard at Barclays. Original rescuers Bob Diamond and Skip McGee are both gone. The new U.S. leadership will have to redouble efforts to avoid the legacy of a sprawling diaspora. 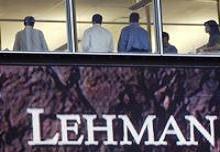 People stand next to windows above an exterior sign at the Lehman Brothers headquarters in New York in this September 16 2008 file photo. Barclays is to shed 7,000 investment bank roles by 2016, the UK lender said on May 8. Launching a strategic revamp, Barclays’ Chief Executive Antony Jenkins committed to exit or run down 115 billion pounds of risk-weighted assets across the group, including 90 billion pounds in the investment bank, or 41 percent of the unit’s total. RWAs in the investment bank at the end of the first quarter were 219 billion pounds. Barclays expects the core investment bank to constitute no more than 30 percent of total group RWAs by 2016, compared to over 50 percent now. The bank also revised several other targets upwards. It said its fully loaded core Tier 1 ratio would exceed 11 percent by 2016, and its leverage ratio would exceed 4 percent by the same date. Return on equity is projected to be above 12 percent in 2016, while the drag from the bank’s non-core division is targeted to be below 3 percent. In total, Barclays will cut 14,000 jobs worldwide in 2014, with an extra 5,000 by 2016.